My colouring book is a colouring kit featuring ten different sketches and patterns that require various skill levels. It comes with its own set of colour pens and sketches in the form of a booklet. All pages are perforated for easy removal and can be framed for posterity. 10 patterns, 10 sketch pens, 3 gift tags, 1 greeting card with envelope and 3 bookmarks with jute tassel gold-plated caps. 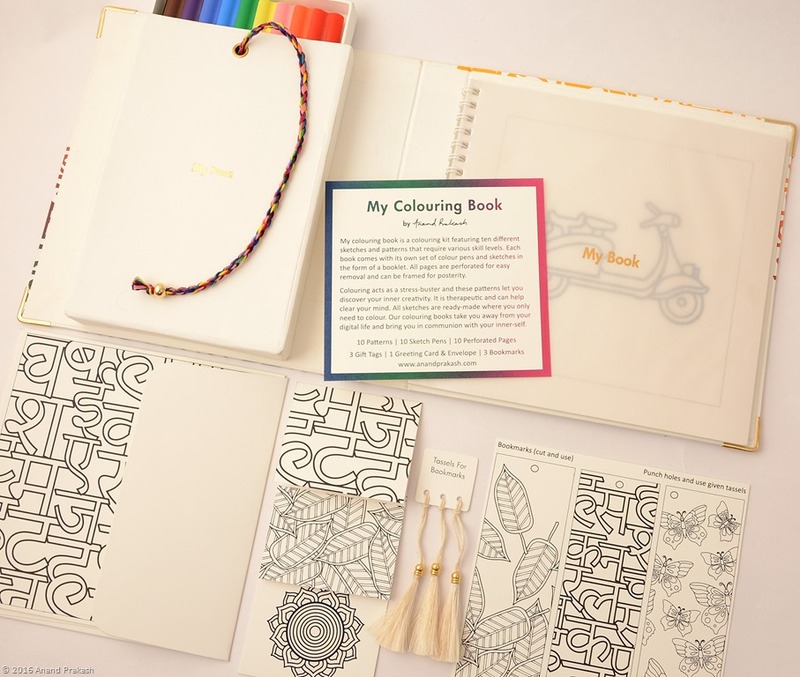 Colouring acts as a stress-buster and these patterns let you discover your inner creativity. It is therapeutic and can help clear your mind. 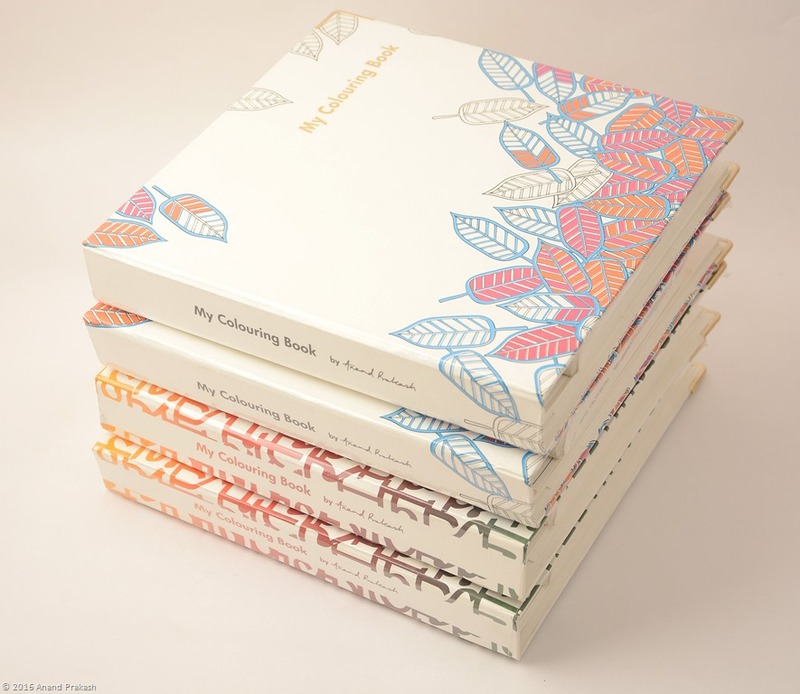 Our colouring books take you away from your digital life and bring you in communion with your inner-self. With all sorts of adult colouring books flooding the market, I wanted to create one which was simple, useful and a style statement. To get feedback, I personally coloured most of the pages. My idea was to create a book that people would love to carry, it had to come with pens and a wiro-bound booklet for easy usage. Attention to detail: We used the same colour of threads as the pens for the closure mechanism on the box, adorned with a gold plated bead. 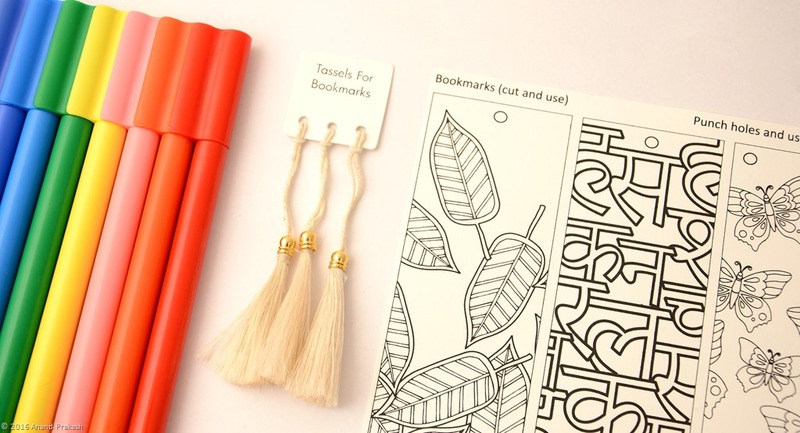 There are three sketches which the user can cut and make into bookmarks using our signature jute tassels with gold-plated brass caps. The corners are adorned with our plated brass pieces. The book with the devanagari cover was screen-printed using a now vanishing method known as vignette; this is very labour intensive and only a few old-school printers remain that are capable of pulling this off on a large scale(more on vignette in a future post). The quality at AP has to be perfect: when the limited edition books were complete we realised that the pages were a little thin and the colour was showing on the other side. We did the booklets again in a thicker paper. This book has been a labour of love and very often I take up projects like these that involve multiple processes in fabrication and printing. Some projects are not commercially viable but are always on the anvil at AP because passion comes before commerce for us. This entry was posted in Whats New and tagged Adult coloring books, adult colouring book with accessories, Anand Prakash, My colouring book. Bookmark the permalink. I need the prices .